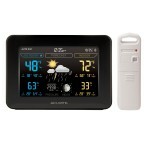 Amazon.com has AcuRite 02027 Color Weather Station with Forecast/Temperature/Humidity on sale for $37.50. Shipping is free. Plan the day with confidence with your own weather and weather prediction information – pinpoint accuracy right from your own backyard with AcuRite’s Color Weather Station. The Weather Station uses patented Self-Calibrating Technology to provide your personal forecast of 12 to 24 hour weather conditions. Self-Calibrating Forecasting is generated from weather data measured by a sensor in your yard – giving you the most accurate forecast available for your exact location.